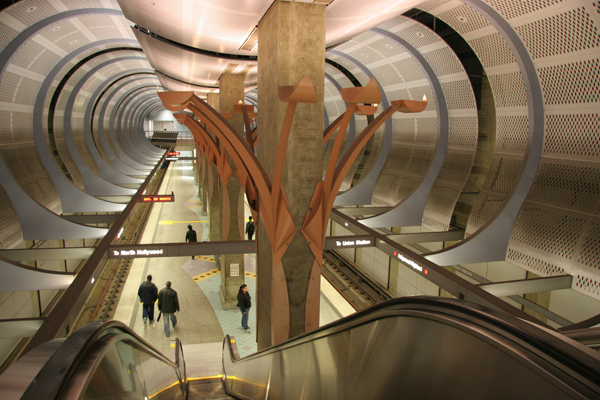 The inside of Metro’s Hollywood/Highland station. The West Hollywood City Council last night agreed to take steps to accelerate the northern extension of LA Metro’s Crenshaw/LAX subway line through WeHo. The vote was 3 to 1, with Councilmember Lauren Meister voting no. Councilmember John D’Amico was on vacation and not present at the meeting. Meister objected to the potential cost of the project to the city and uncertainty about where it actually will run within West Hollywood. Since the passage in 2016 of Measure M, which authorizes a one-half cent increase in the county sales tax to fund Metro’s overall growth plans, many cities and neighborhoods have lobbied to be one of Metro’s earliest projects. In response, the Metro board has adopted an “early project delivery strategy,” which uses certain criteria to assign points to projects and rank their priority. The Metro extension of the Crenshaw line had been scheduled for 2041-2047. Accelerating it means construction could begin in 2020. One of the criteria for ranking projects is whether a local jurisdiction is willing to allocate at least 10% more than the required 3% contribution to the local project. Among the other five criteria in that “partnerships” category are whether the area applying for priority consideration will streamline the construction permit process and whether it will establish a tax district to fund at least 10% of the local extension cost. The 3% match thus would cost the city from $42 to 66 million. To earn points in the early project delivery ranking, West Hollywood would have to commit to contributing 10% more, an amount that would range from $70 to $550 million, depending on the final route of the subway line and the timing of its construction. Meister objected that the unknown amount of money the city was committing to spending on the future project could be used instead to improve existing transit options, such as the CityLine free shuttle service. “I don’t think this is what our constituents bargained for when they voted for this,” Meister said. The resolution adopted by the City Council also would authorize the city to engage a consultant to consider ways to attract private investments into the extension into West Hollywood and other options, such as tax on property that would benefit most directly from the location of a Metro station in WeHo or a local sales tax measure. That revenue would offset the direct costs to the city of the extension. Councilmember John Duran asked that the city consider putting on the March 2019 ballot a cannabis tax proposal. Metro hopes that the Passage of Measure M, which was supported by 86% of West Hollywood voters and 70% countywide, will generate $120 billion over 40 years to fund projects ranging from the Metro extension to sidewalk repairs. An estimated 35% of the revenue would fund transit projects, 17% highway improvement projects and 2% pedestrian and bicycle projects. The remaining 17% would be allocated to cities for their own local transportation projects. We can’t dig or build our way out of this through transportation systems, housing, genetically engineered food or AI. We don’t not see the elephant in the room and IT IS US! “There is no point bleating about the future of pandas, polar bears and tigers when we are not addressing the one single factor that’s putting more pressure on the ecosystem than any other-namely the ever increasing size of the world’s population.’ Chris Packham. It is wise to respect limits and identify ways for each of us to take part in conscious behavior and management of all these elements rather than faster and more exotic ways to get from here to there or increase our boundless financial accumulations. Bigger, Better, Faster is not the answer. The truth is Greater Los Angeles will need to continue to build a larger number of underground subways to accommodate an ever increasing density of people. In just 100 years we’ve gone from orange groves, cow pastures and oil fields to places like Downtown, Century City and Mid-Wilshire. What will it be like in 2118? These costs are well within our budget. Not only are they efficient, clean and modern, can you think of a more beautiful small city a monorail would match! It suits West Hollywood’s forward thinking. The stations could connect within blocks of the subway. For an amount half that cost, West Hollywood could build its own monorail system or electric trolly! The last thing we need is to get caught up in LA’s black hole of transportation. The naysayers and NIMBYs here haven’t done much research. MTA already plotted out likely stations along the, er, “pink line” through WeHo years ago. Obviously a major station would be at SMB/San Vicente, since MTA is already there. No-brainer. Other WH stops would be SMB/La Brea, SMB/Fairfax and (maybe) SMB/La Cienega, with an additional station at Cedars/Beverly Center in LA before connecting with the purple line at Wilshire/La Cienega. This is a smart plan: WeHo is one of the densest neighborhoods in LA county and it is thick with nightlife and thin on parking, so Metro use, both incoming and outgoing, would be much higher than along Fairfax or La Brea. Also, Metro sorely needs a line that would connect the red line to the purple line, for those who don’t want to go all the way to Wilshire/Western to change trains. Also, I don’t want to wait until I’m 77 to be able to take a train directly from WeHo to LAX. I’m happy to pay more taxes for this. The “Pink Line” was rejected by Metro when the Purple Line extension was approved. The only line that would enter West Hollywood would be a future northern extension of the soon to open Crenshaw/LAX line. From the south, it would likely travel LaBrea or Fairfax to meet the Red Line at Hollywood/Highland. West Hollywood officials would prefer a route up San Vicente. The “Pink Line” was simply a creative name that the original Eastside Working Group began referring to this extension of the Purple Line. Just a fun pseudonym that referred to the Purple Line Extension through West Hollywood. The Lobbying efforts of West Hollywood and Lobbyist successfully have and continue to work just which North/West artery The Purple Line Extension will be selected. They are working on selecting the route for the Crenshaw northern extension. The Purple Line is being extended along Wiltshire through Beverly Hills and Century City terminating at the VA Hospital. It will not enter West Hollywood. MTA is referring to the Crenshaw line’s northern expansion as through “West Hollywood” (the line is currently an olive drab on Metro maps). Technically that could include a Fairfax or La Brea alternative, but almost everyone has been on board with the San Vicente/SMB route. Not only because Metro owns the property at that intersection but because the line along San Vicente would be aboveground, as the width of that street allows for it. That’s far less expensive than an underground line, which you’d need for a Fairfax or La Brea route. If we can have only one stop on the Crenshaw extension, I’d prefer Fairfax. Not just because I live 2 blocks from there, but because Fairfax is more central West Hollywood than La Brea, which is right on the border. Even just that one stop on Fairfax would open up the system to people in the area, allowing them easier access to downtown, LAX, and to Hollywood and Highland, which would connect us to North Hollywood, and all red line stops east of Hollywood and Highland. Of course, the 217 and 780 buses both go to Hollywood and Highland from Fairfax and SMB already, and neither take that much time. I’m afraid that the low cost and convenience of Uber and Lyft (especially when using pool) would deter many from taking a train to LAX. Door to door, less time, and no need to get on the “people mover.” Not to mention both are easier when carrying luggage. Fairfax is the likely compromise route which still hits key population points. The portion on San Vicente from Venice to Olympic could be above ground then subway to Hollywood/Highland. Thanks J Rose. I too am onboard with the City and the Lobbyist for the Northern extension. Yes, it has been clear that this preferred route is partially above ground. Similar to the Red line, it splits at Wilshire to keep going North or transfer West still on the Red line. There will likely be a subway on Fairfax or LaBrea…this is more than sufficient before you bankrupt the city with this, or tax to death property owners who are already stretched to the max. I question the judgement of those who are trying to “expedite’ this at a huge cost for a city of only 36,000! And I agree with Eric. We need to maintain whatever village is left of what used to be a peaceful, vacation destination. Now it’s becoming non-stop noisy place with sirens daily. Those who aren’t well traveled may not appreciate what we have here. Leave the excessive crowds for Hollywood, etc. Weho is a gem, keep it that way. Stop taxing us to death! An extra 70 to 550 million? wow, what a range. This money grab is absurd. Wait your turn. There’s no guarantees in government, they just want your dough. It will be built when it’s ready to be built. I am very in favor of the Subway. However 40 years ago, I was excited to take the Subway to Fairfax High. Now, just glad to see the wilshire line go west. I’m feeling sales tax is too high already. It would be a waste of money. The DASH line that went from Cedars, up La Cienega, then winding to Hollywood & Highland would be a GREAT thing to bring back for transit, traffic & access to metrorail & Sunset Ralphs and all the way to Hollywood. Interesting point. The Dash buses have weird routes and schedule that very few can figure out, those buses stop running until 8pm and very few people ride them. Many people wait at 10PM,11,12am almost an hour for a bus on La Cienega/3er St/ Beverly/6th St. The Dash system needs better planning, shorter rides and straight to the metro stations. A $5 unlimited daily pass will be ideal. Or let private buses start running in LA. Kudos to Lauren for being the only Council Member for having the Integrity to the right thing. Spending the money to expedite the subway construction would only get it to us by a few years earlier. That money should be spent elsewhere as she said in the meeting. I believe in spending less money, not more. When the City does spend money it should be done in a responsible manner. Not only that, Bringing a subway station to West Hollywood amounts to bringing a portal to Weho for more criminals and homeless. We don’t need a subway station here. We have plenty of other transportation options. The people of west Hollywood are not going to stop driving and take the train. Go to Hollywood and Vine station, just the second level down, you don’t have to go all the way. See all the homeless and people fighting and asking for money. The Subway is ok for LA but it would ruin the last bit of “village” feel we have left in West Hollywood. We could get a “Fly-Away” service which is an hourly shuttle to LAX like Hollywood has for $7. one way. A few years? Over 20 years earlier is not a few years. In the meeting the staff said without expediting the project it would be here by 2040, if the City pays the extra money it would be here five years earlier. Imagine how traffic would be slowed down to a crawl on SMB during construction. go to any other train station construction site in progress and see the traffic mess. It’s just not worth it. City Council allowing contractors and projects like these to make Weho into just another city without our unique Village feel. Haven’t you lost that village feel with the gentrification of West Hollywood by the Beverly Hills overflow? I refer to WeHo as East Beverly Hills, for this reason and the fact that as a city they do not have their own services (ie; police, phone, power, etc.) like most other cities in Los Angeles County do. Also, you should take a ride on any east west bus on Beverly Blvd., Melrose Ave., or Santa Monica Blvd. where these buses are often filled with a standing load. They stop at each and every stop to pick up and/or drop off. And drivers in personal vehicles often times make unsafe maneuvers around these stops, or refuse to be courteous to the bus when it needs to merge back into traffic. That bus is also filled with people trying to get to work, or home from a long day on the job, and they are just as important as you in your personal vehicle. With a subway system traffic could move much more easily in the area. Be kind to those who don’t have the money to own and keep up a personal vehicle. Your car is a privilege, their need for transportation is not your inconvenience. That’s an astronomical sum of money for our little city of 36,000. More details are needed, but for now, I back Councilmember Meister. While I agree we need transportation in Weho it might be waste of funds. The city of Los Angeles is going to chose a more direct route to the Hollywood/Highland station. More than likely Fairfax because it would hit the LA County Museum of Art, La Brea Tar Pits and the Grove, CBS and then further up the street a stop in Weho at Santa Monica & Fairfax. I think Weho would be better served to fund a trolley like, light rail from La Brea to Doheny (like there used to be) so when people get off at that SM & Fairfax subway location, they can take a light rail in either location. And possible one day Beverly Hills could continue it on to the Century City or UCLA/Vet where the purple line will have stops. The City of Los Angeles doesnt get to pick the alignment, LAMETRO is a county level agency. I do like an alignment under La Brea or Fairfax better than San Vicente, as the costs would be much lower. Savings could be put into a line on Santa Monica blvd. But that should extend from DTLA through WeHo and BH at least. Thank you, West Hollywood City Council, for pushing forward on ways to improve transit in our great City. Although the CityLine service is a great option for some residents, Metro is truly the future. With all due respect to Councilmember Meister, her comment that: “[She doesn’t]think this is what constituents bargained for when they voted for this” seems highly inaccurate since 86% of West Hollywood voted for Measure M in November of 2017. Measure M was voted on during a Presidential cycle, leading many to believe or argue that MORE people came out in West Hollywood to vote than normally seen during WeHo’s elections in March. Although the 14% of people that did not support Measure M should be able to vocalize their opinion, they are overwhelmingly in the minority on this issue and last night’s comments did not seem to offer any tangible solutions to tackling a serious issue like the transportation crisis we see ourselves currently in county wide. Voting no on an item that a majority of residents supported and offering to improve the CityLine service instead seems like poor judgment and a missed chance to really improve the lives of those that she is elected to serve. If we aren’t willing to take a stand on serious issues like Metro, than what are we willing to take a stand on? Her vote last night seems to reflect her willingness to only serve the 14% that did not vote for Measure M, rather than West Hollywood’s best interest as a whole. I have to agree, WeHo votes are getting exactly what they voted for. A faster purple line construction timeline, expanding bus service, road repairs, cycling infrastructure, and funding for a line that will at least skirt WeHo if not go through its heart. They voted for it because it is the right thing for our region to do, even if every single project on the list doesnt benefit them personally. “Housing Crisis”, “Transportation Crisis” “Boystown Alley Fights Crisis”…..Everything is a crisis. The way citizens vote on Measures and Propositions isn’t always the right choice. But in California our elected officials seem committed to that form of “Governing Crisis”. I appreciate Council Member’s hesitation on this “Overspending Crisis” that was not included in the original Measure M proposal. We seem to be operating in a culture of runaway expansion due to the perception of need without taking a look as to how to best utilize resources at hand and what drives artificial need. Elected officials and the community would do well to realize that everything has limits. Constant expansion is not possible driving everything into a state of constant flux. Everything reaches its limits. There is always uncertainty and one should be wary. There’s no possibility of construction starting on 2020! Where did that date come from? Metro hasn’t selected a route. That process entails presenting options to the public in a series of meetings. This is followed by environmental review and utility discovery for underground construction. The Crenshaw Line northern extension is not on Metro’s 28 by 2028 list for projects that can be completed by the Olympics. Cheers to Meister for recognizing how the process works and protecting West Hollywood’s financial resources. It’s still highly likely that Metro will recommend a direct route along LaBrea that will only hit a small portion of West Hollywood. Thank you Mayor Heilman, Mayor Pro-Tem Duran and Councilmember Horvath for you progressive leadership. Your yes vote is one step closer to a groundbreaking in 2020. Your understanding and vision of what West Hollywood must have not just for her resident’s but visitors that are local and worldwide. Mass Transit is West Hollywood future. Again, thank you for moving this forward.